Geodes capture the fancy of lapidarians, rock collectors, rock hounds and everyone else who loves a pretty rock. We've all seen beautiful geodes in shows and shops, and often made them ours. 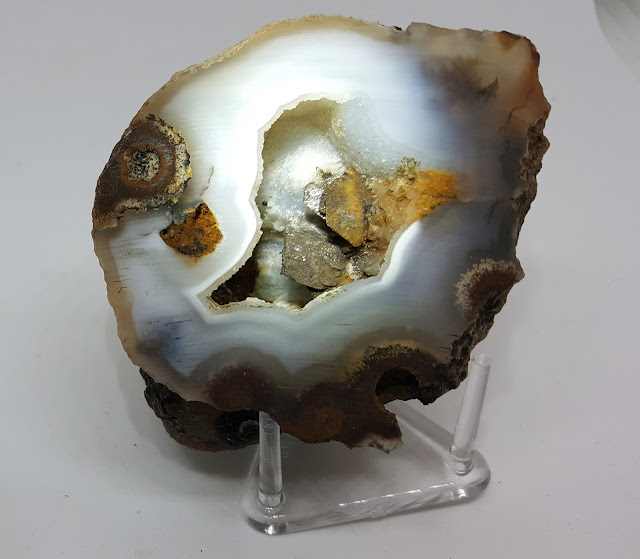 The Dugway geode pictured here is a perennial favorite with its halo of colored quartz stripes that polish beautifully to make the display piece even prettier. WHAT MAKES A GEODE A GEODE? Not every stone with a natural hole in it is a geode. 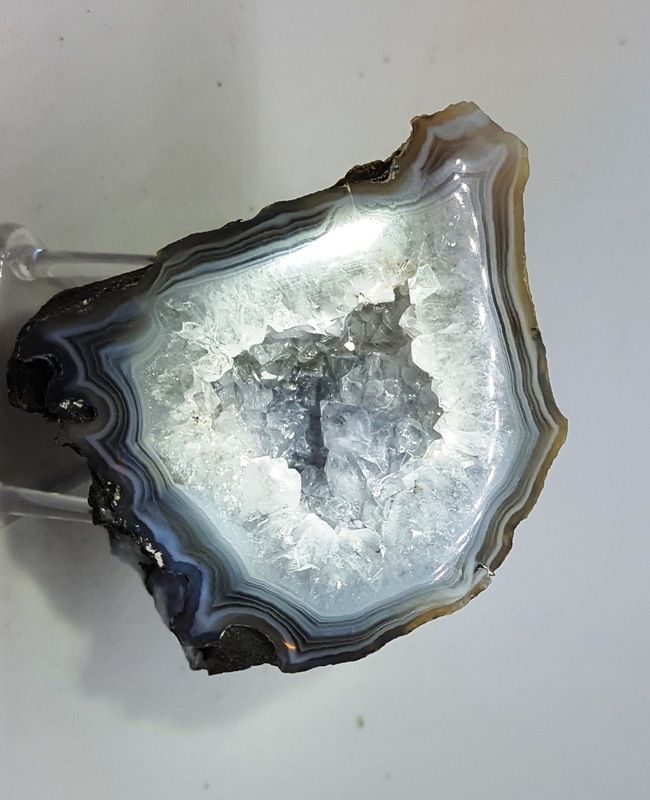 Mindat.org defines a geode as a "chalcedony (cryptocrystalline quartz) shell lined internally with various minerals, often as crystals." 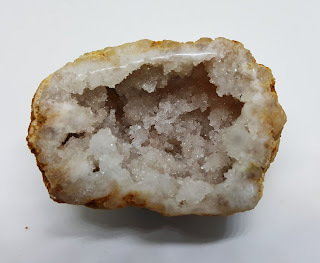 Sometimes the shell is very easily viewed as in the Dugway above, other times the matrix it was formed in has all worn away and you get the spectacular Moroccan geode shown here and often called Potato Geode for the way it looks on the outside, or Sugar Geode for the way the quartz crystals look inside. Geodes usually start as a gas pocket in igneous or sedimentary minerals or a nodule that washes away leaving a roughly spherical space. Over time, waters and gasses passing through leave deposits of crystals that are colored by various minerals. And while they're all unique, for the most part, each one is similar to the next. But every once in a while . . . I like to look for the geodes that whisper stories to me like the one below. There's always something about story geodes. Often it's an inclusion whether it's simple or complex. I left the picture large to make it easier to see the inside which at its longest inside measurement is barely one inch tall. When I first saw it, I thought the metal-looking wedges inside were iron because of the rusty look that was descending from the opening and at the spot on the top. But (a) it's not shaped like most iron and (b) it's not magnetic. The second object looks as if it has flakes like mica, but mica comes in sheets as you may be able to see, the front object has a long triangular shape. I can't see enough of the larger one to tell if it is triangular, but there is one on the top that doesn't show in the photo which also has the triangular or wedge shape. What do you think it is? If you like sci-fi, the whole geode looks a bit like a mine on an ice planet to me. I wish I had a picture of the most ominous geode I ever saw. It was a very large amethyst geode, about four or five feet tall. The thing that set it apart was a single long white crystal pointing into what had been the center. Once the seller had displayed the geode on a stand, the white crystal looked like it was aimed at the viewer's heart. It was scary and I wouldn't want it in my house! Now, this definitely is a fun geode slice. 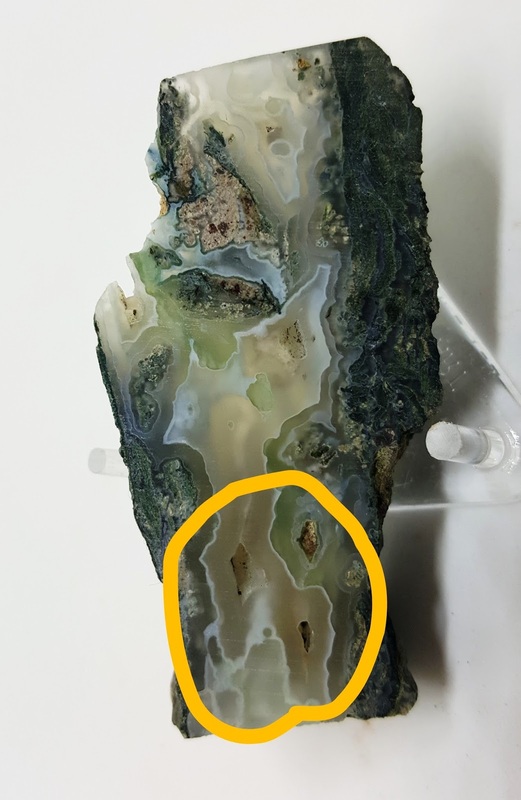 The long structure you can see in the middle of the geode is hollow which I can tell because the back is sliced through the geode structure too. The image below shows the back side of the geode slice with three hollow areas circled. Two are structures shown in the geode and the third can barely be seen in a separate geode structure above. PLEASE NEVER "CRACK" YOUR GEODE! A geode is a natural work of art, not a rock to play "Whack-a-Mole" on! When I see someone at a show who offers to sell geodes and then hit them with a hammer, I want to take the hammer to some sensitive orb on their body. Yes, a hammer will get you into the rock, but it will be shattered into sharp-edged pieces that forfeit the story and the glory they were meant to have. Always, always open a geode with a saw. You can probably us a hacksaw on the more fragile Moroccan geodes, or a workshop or tile saw on a geode in a vise, but the gold standard is a lapidary saw that's roughly proportional to the geode you're opening. For example, a 10" lapidary cutting saw can easily handle a geode that's up to about 4" tall. I prefer to do the cutting by hand so I can rotate the geode as I go, preserving any crystals or druzy that go more than half way through the open area. 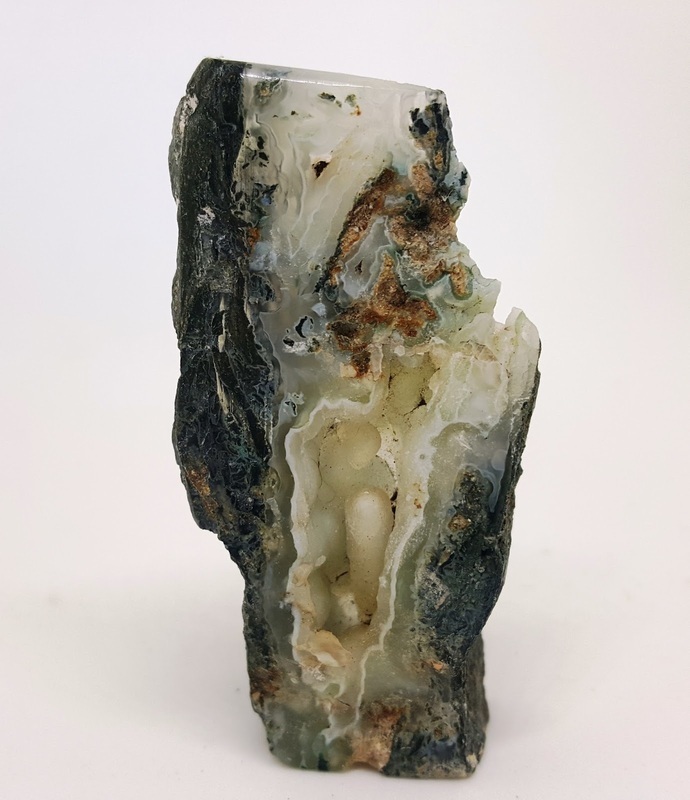 Not every hole in a rock is a geode, vugs are both very similar and very different from geodes, and of course, there are thundereggs which aren't exactly a hole in a rock, but have similarities. But those are for another time. Come back on May 10 for a new blog by your Lapidary Whisperer. You can be sure you get it directly into your email by subscribing at the icon on the upper right corner of the blog. Starry night or Nightmare on Elm Street? You know how sometimes you see a rock or a slab and it instantly reminds you of something else? 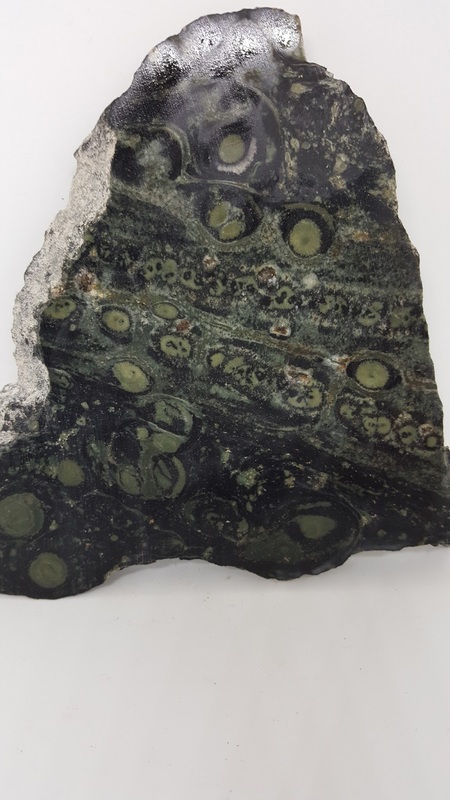 To me, this slab of Kambaba Jasper from Madagascar reminded me of the famous Vincent van Gogh painting "Starry Night". It was something about the orbs and the sense of movement that made me connect the two. 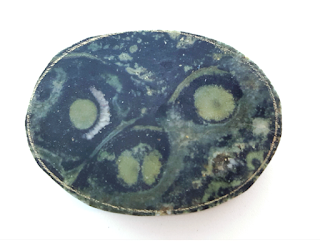 Of course, aside from the color differences, there's the issue that one is made of paint and the other is made of fossilized stromatolite algae, making it a perfect vehicle for me to create my own Starry Night--or a cat? There are so many stories hidden in this piece of jasper, but the one that jumped right out at me was this cat face. This is the slab after I'd scribed it and done the rough shaping. It came with a problem we've all experienced; dealing with orbs and swirls. While those elements are critical to the story in the stone, they can make getting that story to show in the cab difficult since they change size and shape as you grind down the slab. Would I lose the cat and his cute little split nose? I was lucky, pretty much in terms of keeping the most obvious elements, but it no longer says "cat" to me. The eyes are still there, but the cute little split nose, now looks like the mouth of a nauseated alien! Once the cab was done, it became obvious that the different textures of the material were not going to polish evenly. I polished it on my grinder up to 50,000 grit and while it became mildly reflective, the shine is uneven at best. So now, it's not a beautiful, contemplative "Starry Night", it's more of a "Nightmare on Elm Street" kind of cab! Don't miss out on my future blogs! Please go to the top of the right side column and subscribe. You'll get my blog automatically delivered to you every other week and your contact information will never be shared or sold. I'd love to hear about your experiences with stromatolite or other cabbing materials that have multiple textures and shapes. Drop me a note at the comments section below.